Every single recipe for a good health has one common advice: eat healthily. If you want to be fit and happy with your physical appearance, one of the usual advice is to keep away from the snacks. But, what if I told you that you can eat snacks every day and still be as healthy as if you were eating only the healthiest organic vegetables? Want to know what is the secret? Well, it has been around for a thousand of years and here it is, elaborated in this article for you. If you do not want to maintain a healthy diet by eating only carrots and bell papers in your snack time and in between the meals, here is the perfect solution for you: eat deer jerky! This snack has been with us since the earliest ages. Our first ancestors, sitting around the fire after a successful hunting, would enjoy their feast, but would at the same time wonder what to do with the food remaining. So, the first solution for the left-over food was invented back then and it served us until this day: they made jerky! The cave man had to find a way to preserve the food they have harvested, so they figured out that if they would cut all of the excess meat and just leave it under the direct light of a Sun rays, their meat will be as good for later consumption as it was when it was fresh, it even better, if some spices were added during the process. Nowadays, in our modern time, we can enjoy this old recipe, but we can as easily upgrade it to make it the best snack of all times! As a first step when you want to make a good deer jerky, you need a good meat, because of the secret of a good jerky, in fact, is just in using the purest, fat-free meat and the great marinade – but more about marinade later. From all of the meat, the venison is the healthiest, because, in the wild, it is not tainted by any chemicals whatsoever. In the forest, all animals run free, eat and drink what they want and when they want, so they are not served with proteins and chemicals enriched food or water that will make them grow and gain weight in artificial conditions. When the hunters do their part of the job in the forest, the best meat to use to make a deer jerky is lean muscle tissue. When you have the meat at your home, first, refrigerate it until firm, but not frozen, before slicing. We do this to preserve it in a good condition and to help you cut it easier. When the thawing is done, separate all the fat from the meat. This is necessary because it will make your jerky last longer and be even more delicious than you could ever imagine. After all of this is done, it is time for one special part that we have mentioned above, and that will, in the bare beginning, separate the master chef from a plain weekend cook. Yes, it is the marinade, but not some boring marinade: this one has two exotic twists in the end! For that, we need to make something that we can call a regular deer jerky marinade. It requires three pounds of fresh venison, two minced garlic cloves, one large diced onion, one teaspoon of ground pepper and one teaspoon of liquid smoke, and in the end one cup of Worcestershire sauce and one cup of soy sauce as well. Mix it all together in a Ziplock bag and your regular marinade is done. Now, the mentioned exotic twists, which are easy to do, but which will have great results in the end. Number one is the Hot marinade, that is made just by adding the chipotle chili in adobo sauce to the prepared regular marinade. The second one is Sweet and salt marinade, that is made by substituting the Worchester sauce in the recipe with the one-half of the cup of maple syrup. So, when you’ve chosen the marinade you want, simply put the meat strips into it, keep it there overnight and then steam it to an internal temperature of 160°F. This preheating is recommended from The USDA Meat and Poultry Hotline because it will destroy any possible bacteria before drying at a lower temperatures. Now, when you have everything ready, it is time to dehydrate the meat to lose all of its moisture. We do this to kill the microorganisms and pathogens (salmonella and e coli) that would spoil the food. When dehydrated, food can last for a longer period of time and you will always have unique and ready snacks for yourself and your loved ones. Well, you can do it in the old fashioned way, as it was done in front of the cave men homes or in ancient Egypt: in direct sun light. The only bad side of this method is a fact that you will need at least three weeks of uninterrupted sunlight, with someone present 24/7 to overwatch the process. If this seems too complicated, you can use your home oven as well, but, the downside of this method is that if you lose your attention only for a couple of minutes, you will end up with a cooked meat. And, yes: this process is proven not to be neither environmentally friendly nor cost-effective because you will use too many energy to do that task, that your monthly salary will not be enough to cover the cost of your electric bill. Because of all of the mentioned, we use food dehydrators as the cheapest, easiest and the best solution that can help you to make the process of making the deer jerky easy and fun! When you have prepared everything according to the recipe above, you now just lay down the strips of meat in a single layer on top of drying rack of your dehydrator. Make sure they are not overlapping and set the dehydrator thermostat temperature to 125 to 155°F. Time of dehydrating depends on a temperature: you will need 10 hours of dehydrating at 125°F, 8 hours at 135, 7 hours at 145 and 4-5 hours at 155°F. After the needed time, you will know when your jerky is ready: it will change the color and it will bend and crack easily when you take it off the dehydrator and cool it down. The good thing is to remember or write down the exact time of dehydrating, so you could do it more relaxed next time. So, now you have your great snack, ready for consumption or for preservation. Amazing thing is that this food has a one to two months of a shelf life, but if you freeze it, it can be as tasty and fresh for entire 6 months! 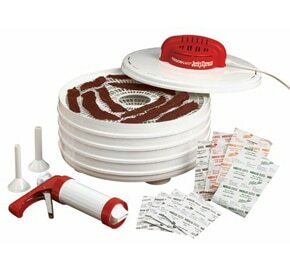 Well, we have told you the process, our secrets and everything you may need to prepare deer jerky in a food dehydrator. We can not wait to see your final results or to get to know some of your own special twists in the making process or in the recipe. Share with us how do you do it or how the jerky turned out in the end with our own recipe or method from this article.